The T&G reported paid circulation declines about on par with expectations because of recent pricing changes; and also continued to report significant growth in its online audience. Daily circulation declined 9.5 percent to 71,034 Monday through Saturday; and Sunday declined 10.3 percent to 81,461. Looking only at weekday circulation, and comparing the annual Oct-Mar reporting periods, this represents a 16.2% decline in circulation over the past 3 years. The audience for the paper’s website is expanding, but they’re planning to erect a paywall. Jeff points out that the # of unique visitors to the site is growing 3 times as fast as page views. I’d like to see how many hits the CentralMassNews websites are getting; it’s actually interesting that they don’t mention those numbers in their advertising information. My husband’s frustrations with those websites are the same as his with how the T&G local sections used to be set up. He subscribed to the newsletter for the Daily Leicester, and half the news was from Shrewsbury. Similarly, when the Telegram had local editions, the Worcester local section regularly had stuff about Holden, when (for our area of the city) happenings in Paxton and Leicester are much more relevant. I’d also like to point out that ShrewsBuried gets a HUGE amount of comments. Little five-sentence posts get more comments than I get in a week. Sorry for those digressions…but I think local news matters. Are people subscribing to the Telegram for AP articles that they could get on Yahoo? Or are they subscribing for the things they can’t get anywhere else — the obits, the calendar listings, the local coverage? 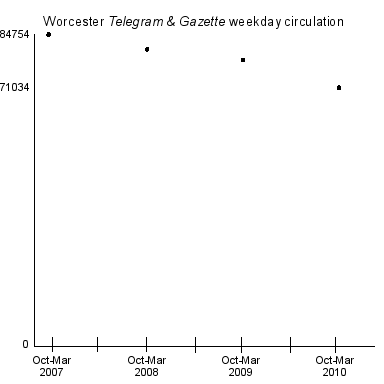 How long has it been since the Telegram cut back on local news and how has that affected circulation? What if the Telegram decided that they’d have an experiment: for three months, or for six months, they would cover local news the way it should be covered. The staff at the T&G KNOW how they would want things to be in a perfect world. Why not pick a relatively short timeframe, and say that for that period of time, the T&G will act as if Worcester County is the most important place on the planet? No meeting will go uncovered, all tips will be looked into, columnists will refrain from writing about Tiger Woods, etc. I obviously think that the T&G should be more creative in their approach to news, even if the creativity just consists of having Victor Infante publish more articles for the paper. Can you imagine what would happen if the Telegram advertised for a writer who’d turn in a news item and a blog item in the way that WoMag did? Or if they asked people to take notes and offered to teach them a bit in the way of journalism? Or if they had some sort of rational voice to counterbalance Robert Z. Nemeth?